Vietnam has made some changes in its plan to host the 2016 Asian Beach Games (ABG) in a way that the biannual event will be economically held, the government website said Sunday, citing the Prime Minister’s ruling. While the Southeast Asian country previously announced that the ABG will take place in three localities, namely Binh Thuan and Khanh Hoa provinces in the south-central, and the central city of Da Nang, the latter will now be the only location for competitions. The event will mostly take place at Da Nang’s My Khe beach. Prime Minister Nguyen Tan Dung also gave a nod to the proposal to cut some favorite beach sports from the event, to be held from September 23 to October 4 next year. The removed sports include windsurfing, sail-boating, dragon boat racing, and sea-doo racing, whereas such sports as beach petanque and beach bodybuilding will be added as alternatives. 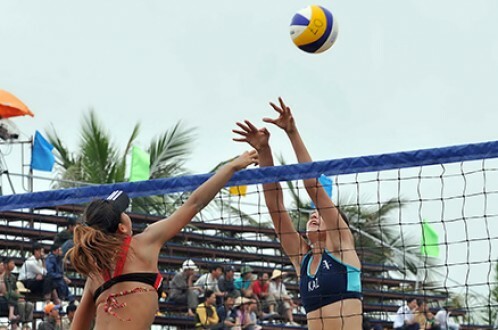 Vietnam had proposed to the Olympic Council of Asia (OCA) that it would host the 2016 ABG, the fifth edition since its inauguration in 2008, in three locations to introduce its beautiful beaches and sea tourism in the central region to the world, according to an official from the Vietnam Olympic Committee. But the OCA has recommended that Da Nang be the only location for competitions to help save expenses and transport time, following a field trip to the three sites, the official said. Another reason that makes Da Nang the best choice is that it is the only among the three localities to be connected with international flights, according to the OCA. Athletes would have to travel both by air and road to be able to attend competitions if the event was to be held in Khanh Hoa and Binh Thuan, which the OCA deems inconvenient. In the meantime, a representative from the Vietnamese Ministry of Culture, Sports, and Tourism said Vietnam has proposed to remove the windsurfing, sailboating, dragon boat racing, and sea-doo racing from the list of sports to compete at the event because it costs a great deal to buy the necessary equipment for these games. Vietnam may have to spend hundreds of billions of dong on buying and hiring facilities, including big ships, for the sports, according to the official. (VND100 billion = US$4.6 million). The Southeast Asian country is expected to welcome 3,500 athletes, coaches and officials from 45 Asian nations during the tournament. Vietnam ranked fifth on the overall medal tally with eight gold, 12 silver and 20 bronze medals at the last edition of the event, which took place last year in Phuket, Thailand.